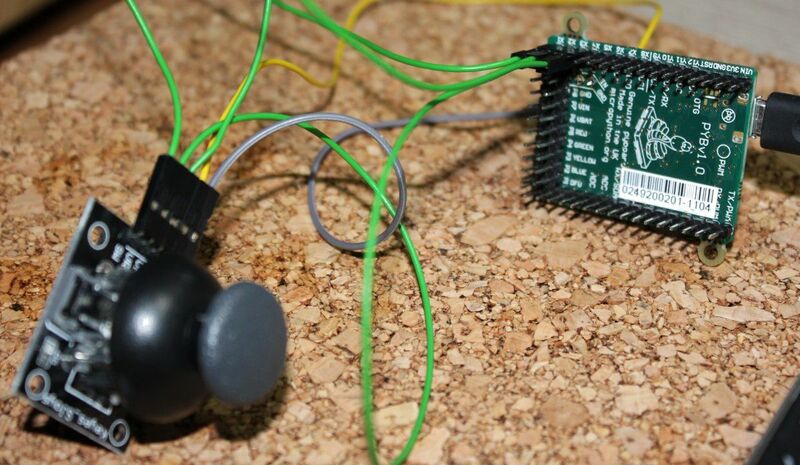 Using analog joystics and precise PWM control for running DC motors. The update process is described on the wiki. You need a Linux with dfu-util which ought to be in the repository. As the descriptions says you have to disconnect everything from pyboard and the board itself from any power. Then connect DFU with 3.3V and connect the board to the PC. When you see done parsing DfuSe file the update will be complete and you can disconnect pyboard from the PC and remove the pin connection. For the X and Y axis values (potentiometers) the ADC class is used which reads a digitalized value of current that changes when potentiometer resistance changes due to gauge position change. The push button is used by Pin class. It has a pull-up configured as my joystick board seemed to need for the button state to be correctly determined. Note that between various joystick board returned values may differ (even a lot), and you must experimentally see what is the best value range of each axis and map it on your own scale, that later can be used to control something else. At first we create a timer with it's ID and frequency. Next we create a channel, set it to PWM and select pin for it. Setting value to pulse_width determines how fast the motor will run. After creating the channel object you can use the pulse_width method to set it with values you like to stop or move the motor with some speed. Best value range also must be discovered experimentally.